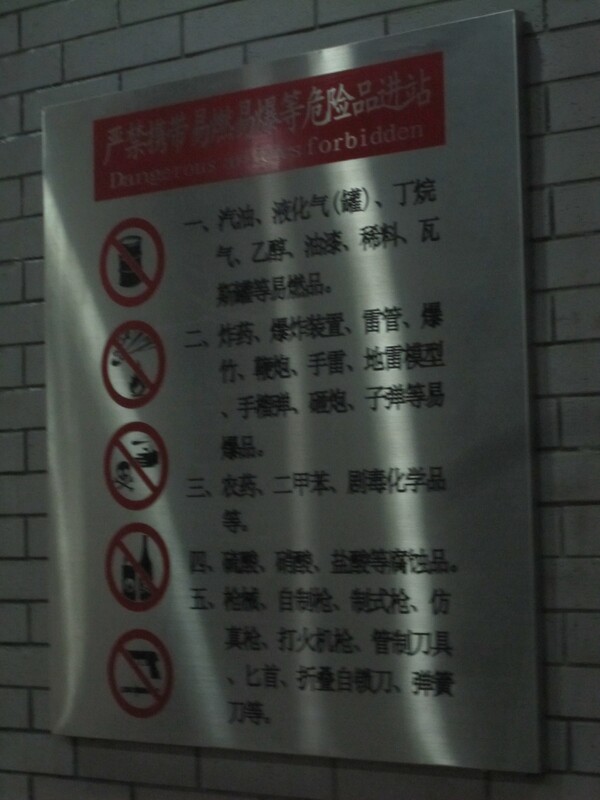 Do not carry anything that might even be imagined to be suspicious on the subway. Or at least not if you lack the Mandarin to understand what’s being challenged and why! Anyway – one of the attendants insisted we leave the station immediately: ‘take a taxi!’, another was asking that the bag be re-scanned, and the third pointed dramatically at my can of deodorant, and the flammable icon on the side. Now, this wasn’t what the Lynx effect adverts told me expect (ok, and it wasn’t Lynx, in case you think I’ve totally lost my mind)! We were warned that we might have to sip our water to prove it wasn’t liquid explosive; I wasn’t going go do the same here! I’m sure that the equally flammable lighters folks carry in their pockets are handled with just the same caution, which might be quite a good way of dealing with the endemic smoking problem here! I can’t quite imagine how ridiculous (let alone pungent) it would be if you couldn’t take deodorant on the tube in London.